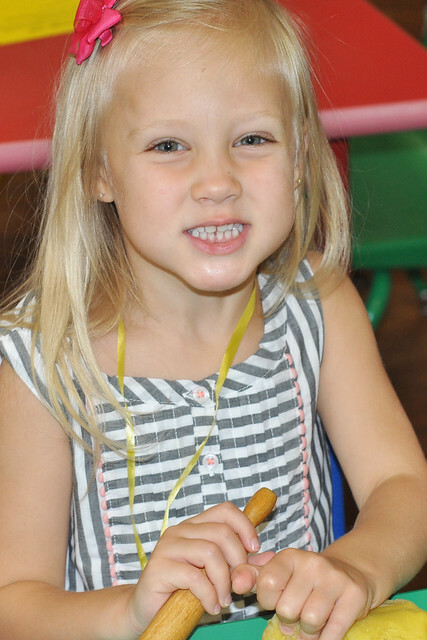 Our Five Ring Circus: Lily Goes To School! It's official! We now have THREE kids in school! On Wednesday, September 9th (which also happened to be our 15th wedding anniversary! 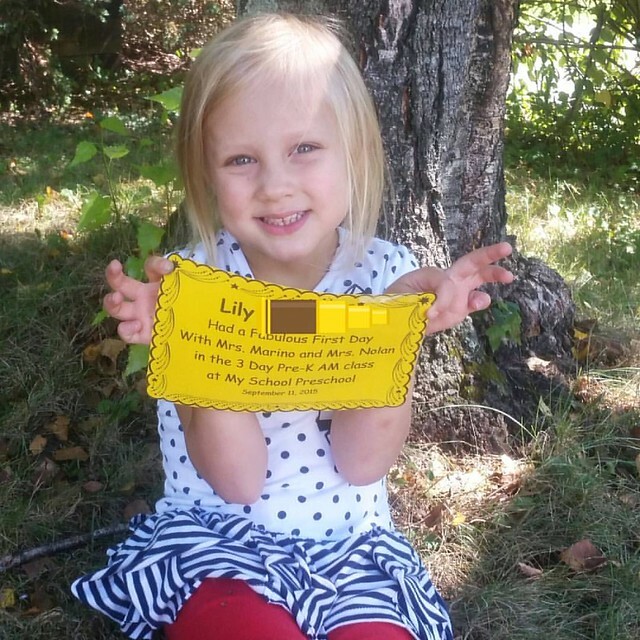 ), Lily went to school for the very first time! I tried to push the fact that my baby was growing up out of my mind, but it was inevitable. 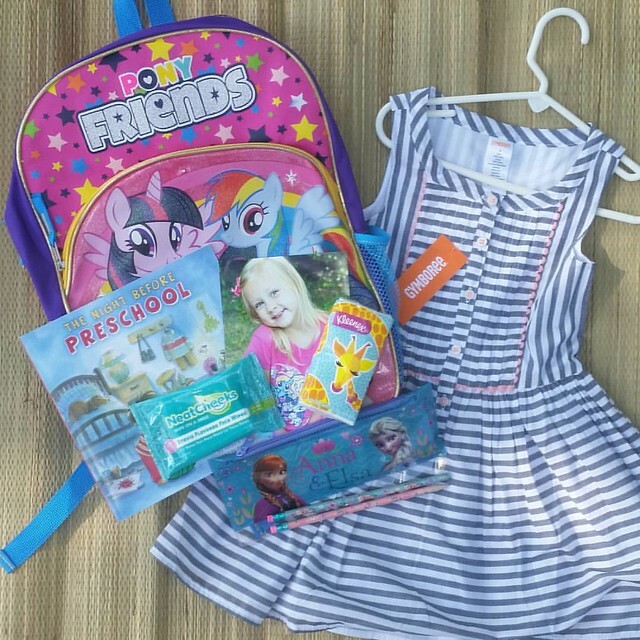 Before I knew it, the day before preschool was here, and it was time to pack up her backpack and pick out the first day of school outfit! 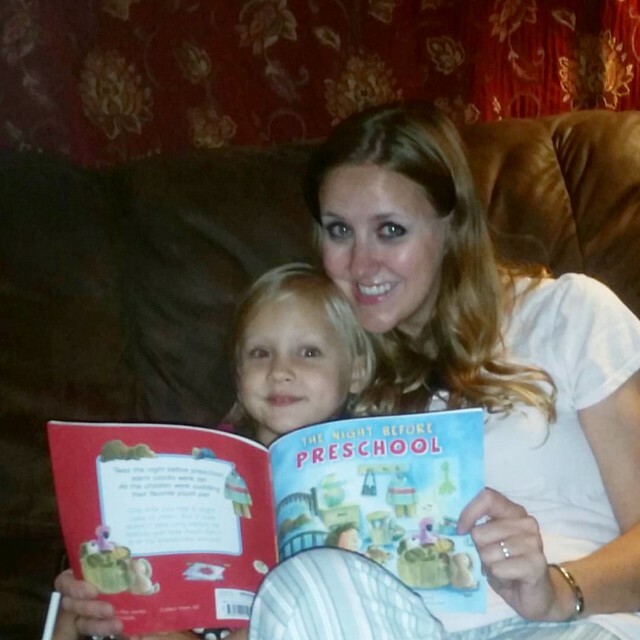 We curled up on the couch to read The Night Before Preschool, and I only shed a few tears! 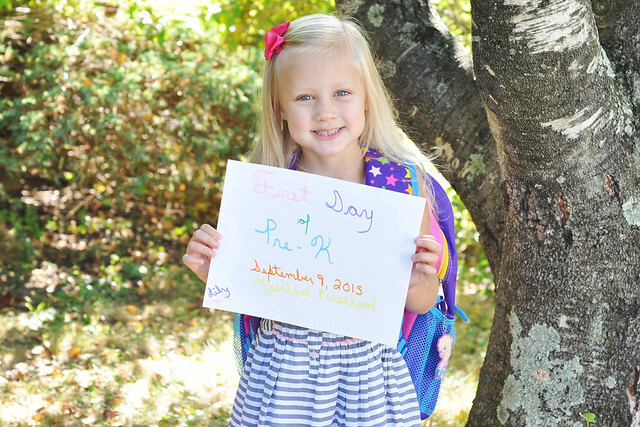 On the big day, Lily woke up full of excitement and ready to go. She couldn't wait to eat her breakfast and put on her pretty dress! 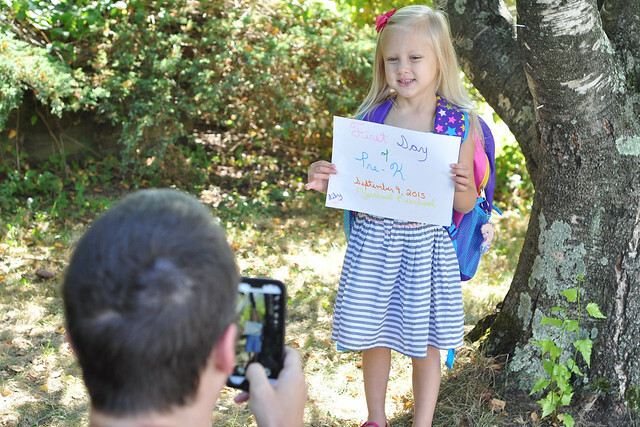 We got ready a few minutes early so we could do a quick First Day of Pre-K photoshoot. She had no trouble letting her personality shine through! Grant took the day off work so he could be there for Lily's first day and so we could celebrate our anniversary! Lily was so happy! 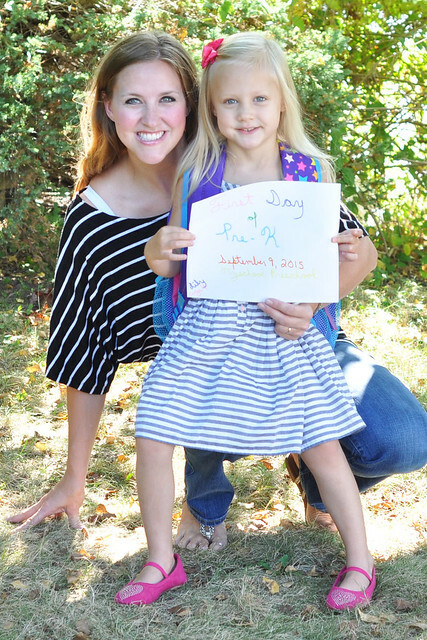 On the first day of school, a parent gets to go with their child. 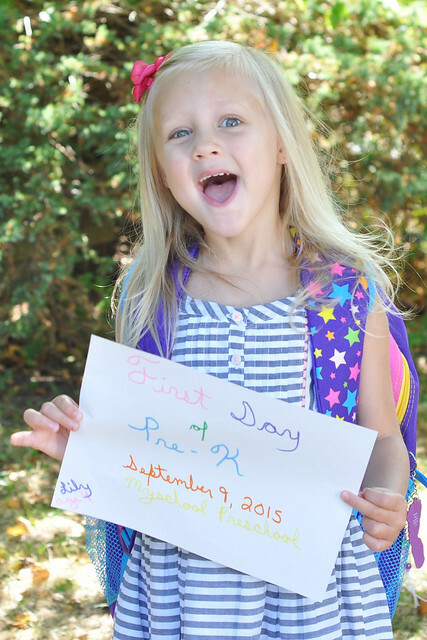 Lily and I headed off to Pre-K together, just as I had done with Dylan and Lexie! 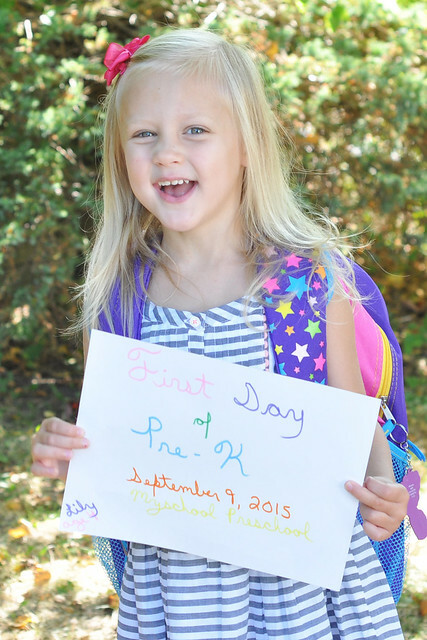 Lily is attending Pre-K at the same school Dylan and Lexie attended. She even has the same amazing teachers! 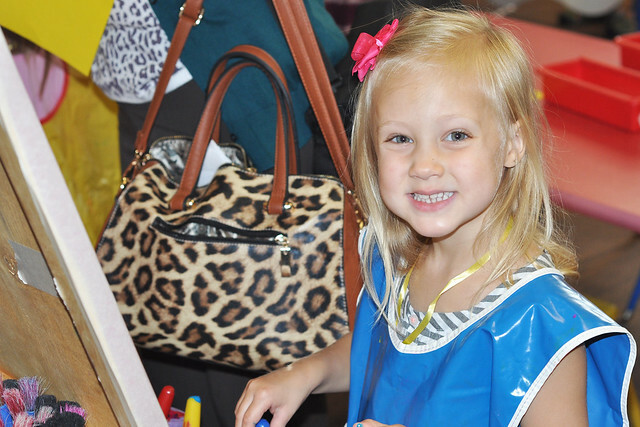 She was so excited to discover everything in her new school. 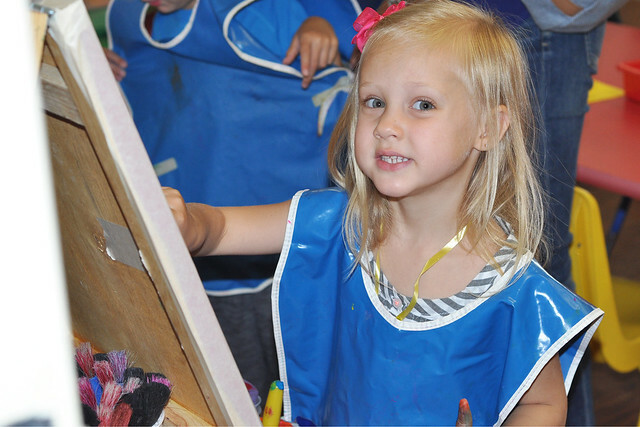 We met her teachers (she was only a newborn when Lexie was in Pre-K), did a scavenger hunt, played with all the fun toys, met some classmates, and took a picture together for a big mural near her classroom. She LOVED it! She loved it SO much that she kept asking when it was time to go back! 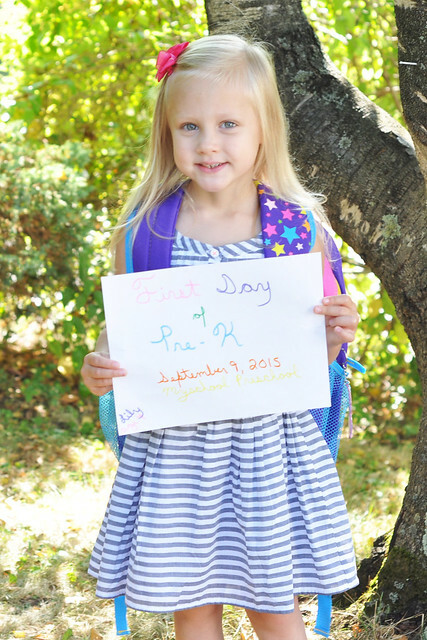 On Friday, she headed back to Pre-K. This time, she went alone. 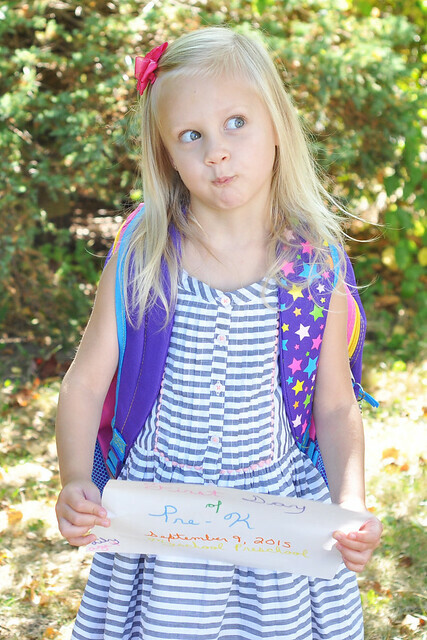 When I dropped her off at her classroom, she walked in, and didn't even look back. She had a great day! 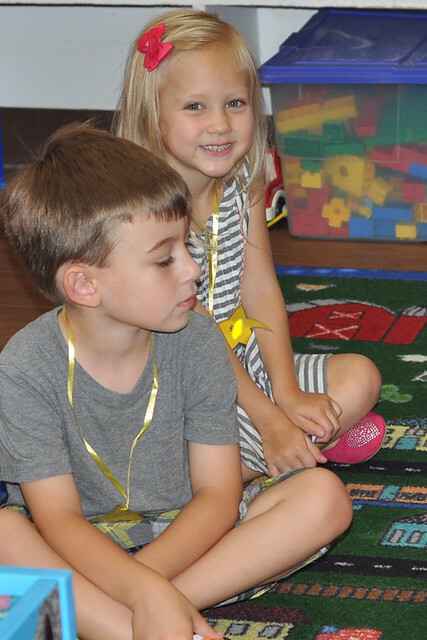 I'm so glad Lily loves Pre-K as much as her brother and sister loved it! I know she's going to have a fun year! 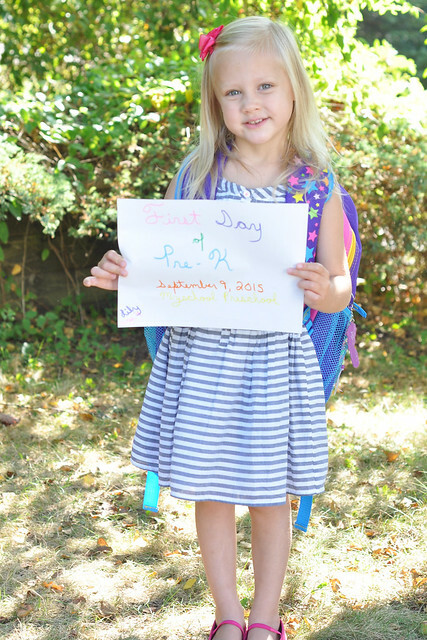 How was your child's first day? Thank you! XOXO It sure does! Oh she just looks so big. 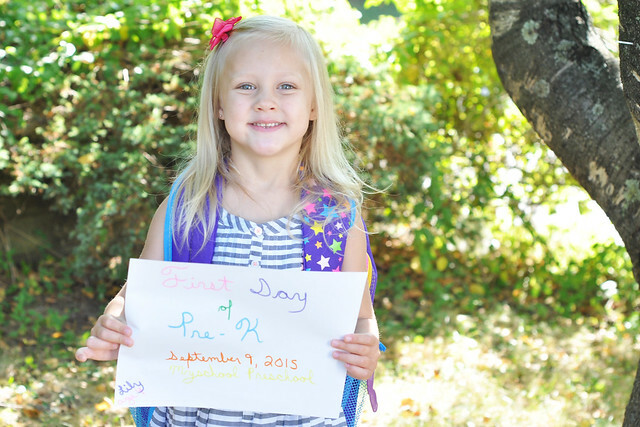 I really wish Emily could have gone to the Pre-K that her sister did but it closed Marissa's last year. Too bad. 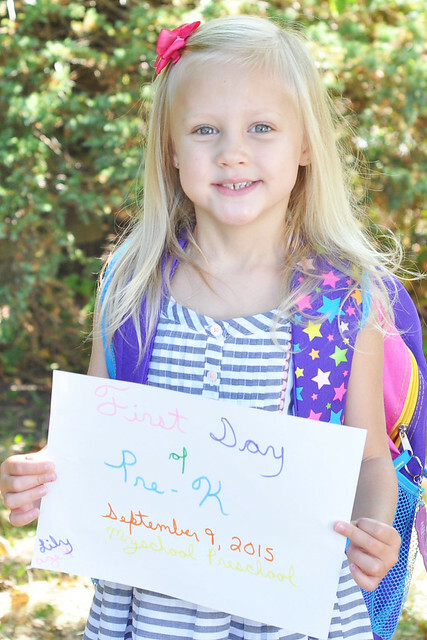 I hope she has a fantastic year! She suddenly looks so old! That's too bad that it closed! 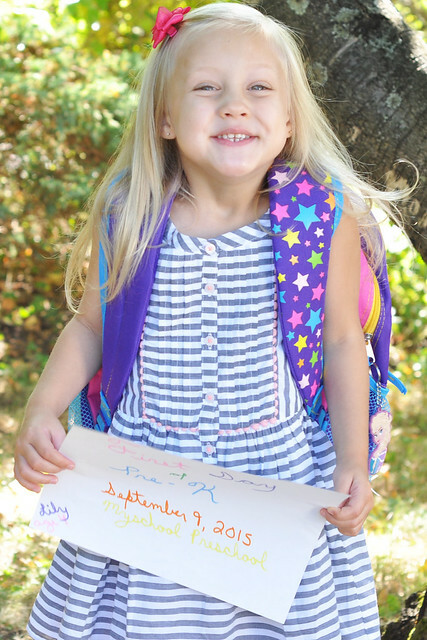 I'm so thankful that Lily can go to the same school and have the same teachers as Lexie and Dylan! My kids are all in junior high and high school. When they were younger, I'd always cry on their first days. Your daughter is adorable. 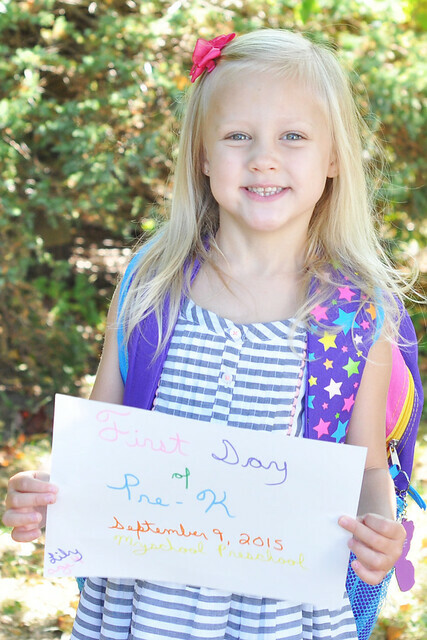 Hope she has a great school year. So cute and Happy Anniversary again! What a cutie! I'm sure she'll be an amazing little student. Thank you, Tracy! I'm sure she'll be entertaining. Haha! Whoo hoo! 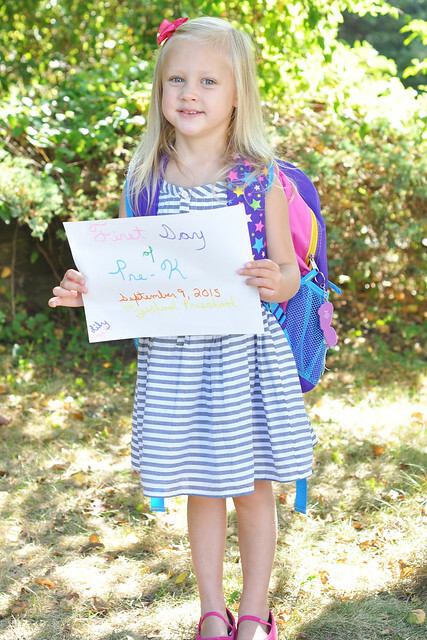 I'm glad Lily had a great first day at pre-school! So precious. Thank you! She still loves it!